Exiting news from OB Cues! I got this email last week and I can now order any shaft you would like. I will off course have a OB-2+ shaft myself, I will let you know how it feels. “We are very excited to announce the launch of a new era for our company and a new era for performance pool cue shafts. Since 2005, the design and performance of the OB Shafts have remained mostly unchanged….until now. The original laminated SR6 construction that we have used for the last 9 years has now been changed to a solid maple SR6+ construction. 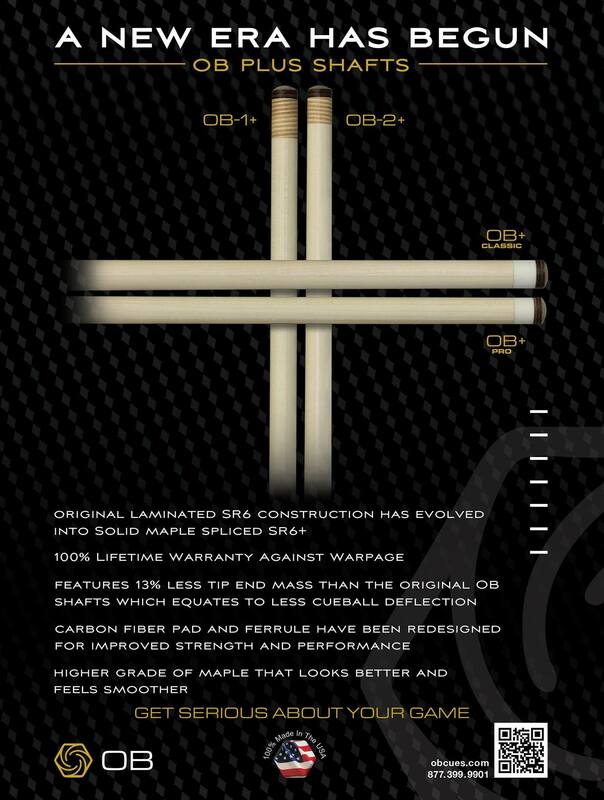 All new OB Plus Shafts will come with a 100% lifetime warranty against warpage! The tip end mass in the new shafts has been reduced by an average of 13%. Less tip end mass is the primary key to less cueball deflection. You reduce the tip end mass and you reduce cueball deflection. The carbon fiber pad and ferrule have been redesigned for improved strength and performance. The pad on the Classic+ and Pro+ shafts is now recessed into the top of the ferrule. The ferrule material on the Classic+ and Pro+ shafts is now Linen Melamine which is even stronger than before.